Al Hartmann | The Salt Lake Tribune Salt Lake County Mayor Ben McAdams welcomes art and ballet benefactors in the 12 foot excavated hole in the ground for a groundbreaking and christening of the Jessie Eccles Quinney Center for Dance and renovation of the Janet Quinney Lawson Capitol Theatre at 50 West 200 South in Salt Lake City Monday September 16. 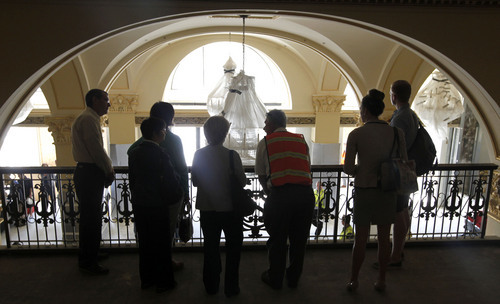 Al Hartmann | The Salt Lake Tribune People tour the old Capitol Theatre's renovations after the groundbreaking and christening of the Jessie Eccles Quinney Center for Dance and renovation of the Janet Quinney Lawson Capitol Theatre at 50 West 200 South in Salt Lake City Monday September 16. 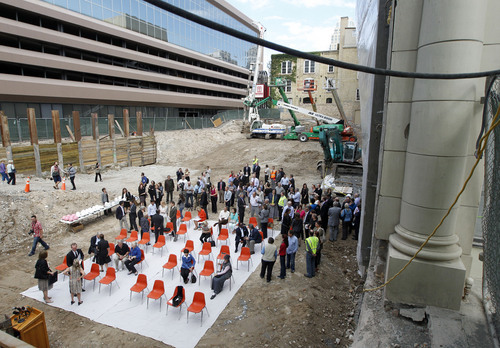 Al Hartmann | The Salt Lake Tribune Salt Lake City and Salt Lake County officials and art and ballet benefactors gather in a 12 foot excavated hole in the ground for a groundbreaking and christening of the Jessie Eccles Quinney Center for Dance and renovation of the Janet Quinney Lawson Capitol Theatre at 50 West 200 South in Salt Lake City Monday September 16. Al Hartmann | The Salt Lake Tribune People tour the old Capitol Theater's renovations after the groundbreaking and christening of the Jessie Eccles Quinney Center for Dance and renovation of the Janet Quinney Lawson Capitol Theatre at 50 West 200 South in Salt Lake City Monday September 16. 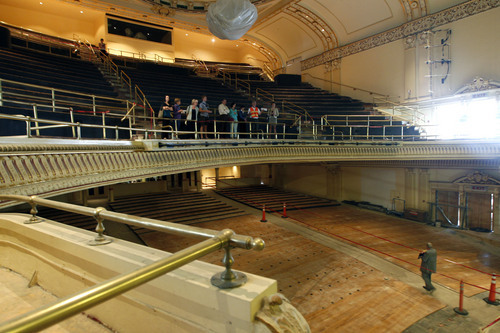 Al Hartmann | The Salt Lake Tribune People tour the old Capitol Theatre's renovations after the groundbreaking and christening of the Jessie Eccles Quinney Center for Dance and renovation of the Janet Quinney Lawson Capitol Theatre at 50 West 200 South in Salt Lake City Monday September 16. 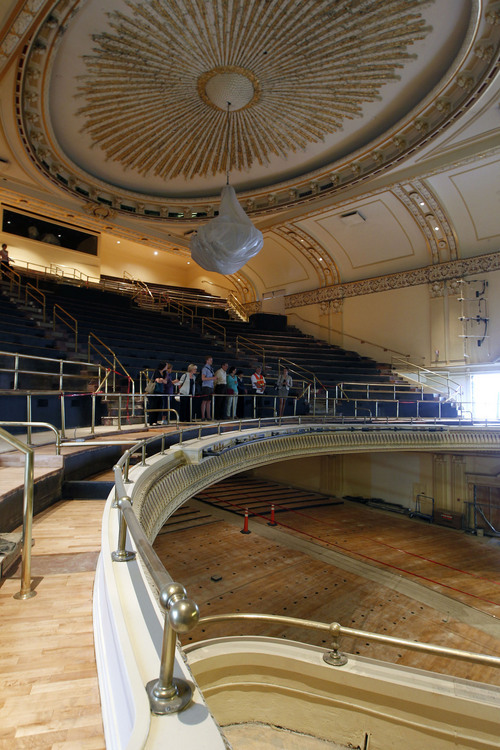 The Capitol Theatre renovation won&apos;t be done until December, but if you can&apos;t wait to see how things are going, try watching this video. Posted Monday by Youtube user lucematt, the time-lapse video is the latest in a series of weekly entries that show the progress of $33.4 million project. 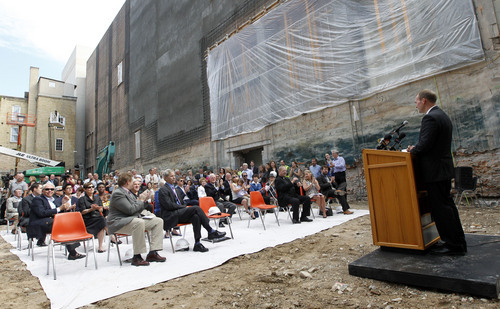 The project officially broke ground Monday and includes a renovation for the 100-year-old theater, as well as construction of a new home for Ballet West. So far, the videos just show prep work, cranes twisting their necks around like geese and excavation of the construction site. However, even at this early stage they offer a fascinating look into the process of putting two buildings right next to each other. According to a description accompanying each video, a new entry in the series should automatically go up every week. Enjoy.